What Causes Lethargy in Ball Pythons? First off, if your ball python is behaving lethargically, which means that he or she is being sluggish or lazy compared to his or her usual self, take a breath and don’t worry: chances are there’s a completely healthy explanation for your ball python’s behaviour. There are only a few very rare circumstances where lethargy can be alarming. I’ll go over these in a second. The most common cause of lethargy in ball pythons is that they are preparing to shed. Snakes do not like to be active for about two weeks before a shed, which is a part of the ball python shedding process. My guess is that this could be because they want to conserve their strength for the shed, or because their layer of old skin is too irritating to be slithering around in, but for whatever reason, they are very likely to act lethargically in the days leading up to them shedding their skin. 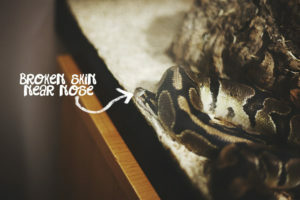 Havana, my three-year-old ball python, will literally sleep for a week and a half straight before she sheds her skin. She won’t even bother to sleep in her hide, maybe because she finds it uncomfortable to be in her hide during that time. Either way, if she’s shedding soon, she’s just not going to go in or be doing any real moving. 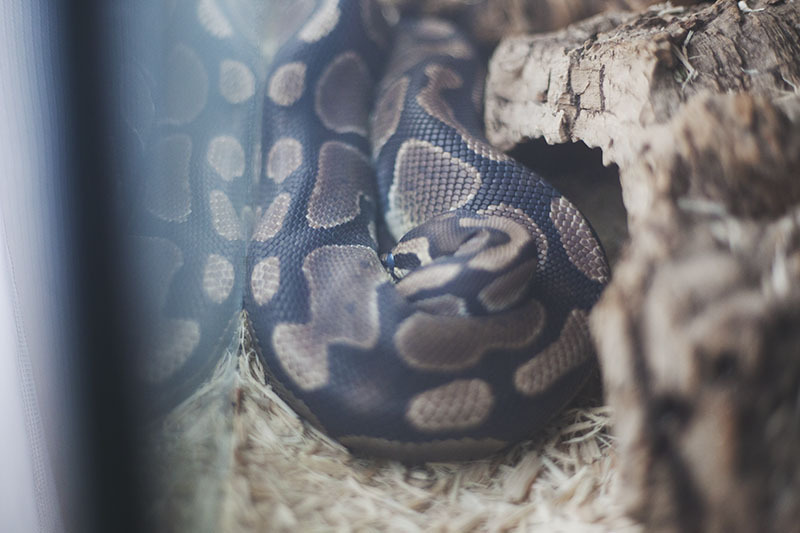 In order to tell whether this is why your ball python is behaving lethargically, keep an eye out for the signs that your ball python is going to shed soon. If your ball python shows these signs, you’ve discovered the reason behind the lethargic behaviour. The second most common cause of lethargy is having recently eaten. Ball pythons use the vast majority of their energy on digestion, so when they have just eaten a few hours ago, or even a couple of days ago, they’re not likely going to be quite as active as regular. They may even sleep for prolonged periods of time, up to two or three days from what I’ve noticed, often until they defecate. If you’ve recently fed your ball python, this is likely the cause of any lethargy. Just give your pet some time to recuperate: the snake will be slithering all over his or her enclosure again in no time. Environmental problems can also cause ball pythons to become lethargic. Ball pythons will usually remain quite still in a warm spot in their enclosure if they are feeling cold. 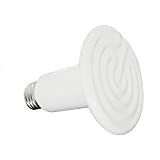 Unlike humans and other warm-blooded beings, reptiles like snakes, as well as other cold-blooded creatures, do not produce body heat to warm themselves. This is why they can (LINK) go so long without eating (LINK). 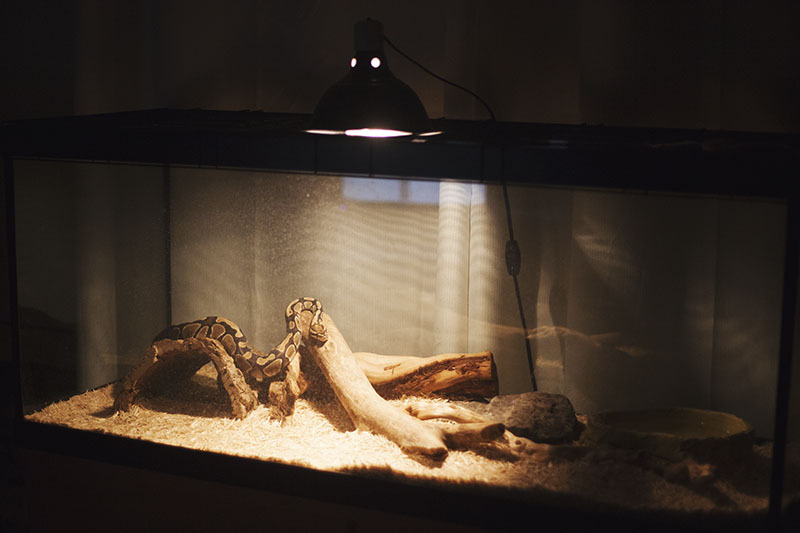 Thus, if your ball python is looking lethargic, be sure to check the temperatures in your enclosure to make sure they are where they should be. The only time you should be worried about lethargy is if it’s paired with other symptoms. 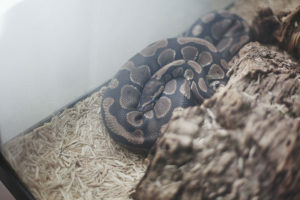 Mucous in your ball python’s mouth is not a good sign (and is often the result of a respiratory infection), and diarrhea could be a sign that your ball python has a severe case of salmonella. 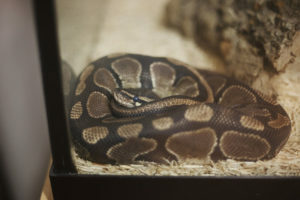 In either of these cases, you should take your ball python to the vet immediately, as in the case of respiratory infection, your pet will need antibiotic shots that can only be prescribed by a vet, and in the case of salmonella, you can really only tell for sure if your pet has salmonella, what strain it has, and how to treat it, by visiting a vet. It’s possible that your ball python is getting ready to shed. At the same time, if he has not eaten while not being in the shedding process, there is room for concern there. I’d recommend taking the ball python back to the breeder/pet store you got him from to see if there’s anything else they can advise! Good luck & I hope he eats the live baby rats. Sorry I didn’t get a chance to reply quickly :(. Hope your ball python is okay but no mucous sounds to me like he may have been a little sick but was fine. I’d take him to the vet, but he could’ve just been getting ready to shed. I have 6 Ball Pythons and Recently my Champagne one has diarrhea. And now all of a sudden he’s super active as well… Is it possible that it’s sometimes a random thing that happens here and there? because he doesn’t seem to be acting weird other than being more active than usual. He was fed 2 days ago. I am slightly scared but I am just trying to stay positive and believe he’s ok. Active as in climbing the tree the log the glass ran laps around his aquarium and everything right after his diarrhea poop. This sounds like perfectly normal behaviour to me. Havana used to be *really* active at times as well: http://mypetpython.com/bump-in-the-night/ The fact that your BP is more active than usual is a little strange, but not strange enough for me to assume it’s because Champagne is sick. I do believe that diarrhea can happen without them being permanently sick. Maybe the rat it ate had some salmonella last time? Unless the snake is lethargic (i.e. not moving much at ALL) I wouldn’t be worried. Hopefully the diarrhea will resolve itself and same with the strange behaviour, though like I said, this active behaviour seems to only be strange for your ball python and not ball pythons in general, as ball pythons do get really active at times. Especially (if I recall correctly) after they take a dump, lol. So yup, I do believe Champagne is ok! Good luck! My ball python just finished her shed nearing 2 or so weeks ago now. Normally after all the old skin is gone she’s climbing and moving around a lot and now she hasn’t been doing much of anything at all. it’s been a week since she’s ate so I don’t think it’s because she’s digesting either. 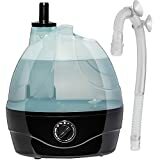 How does one check the animals mouth without getting bitten? I would suggest taking it to a breeder to get her checked out just in case. How Long Do Ball Pythons Take to Shed?